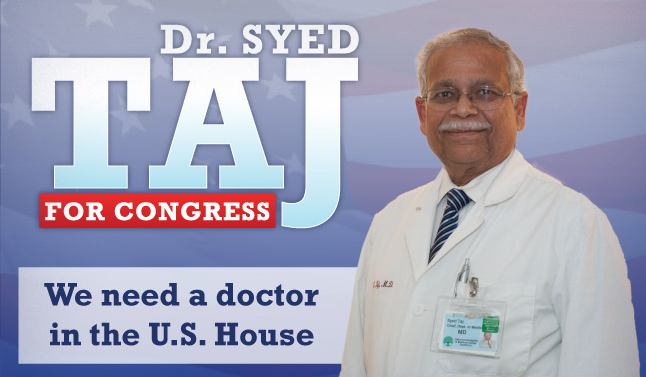 Syed Taj, who happens to be a Muslim American immigrant, is running as a Democratic candidate for Congress in Michigan. His opponent has just run a nasty add on television claiming that he wants to ‘advance Muslim power’ or something of that ridiculous nature. Part of what drew me to this country was the ability for everyone to freely practice their religion and respect the rights of others to do the same. I remain steadfastly committed to this ideal, and I am disappointed that others would seek to score political points simply because I attend a mosque. That’s right on the money and the perfect way to transcend the nastyness that was thrown his way. Taj deserves to win this race because the principles he poignantly outlined can only enrich America and make it a stronger and safer place. He’s also reinforcing the vision of the Founding Fathers. What can be more ‘American’ than that? It’s a bit ironic that sometimes the best and brightest Americans are those who have just arrived. Sometimes they also happen to be Muslim.